Collagenases are proteolytic enzymes able to cleave peptide bonds in the triple helical collagen molecule. Recombinant collagenase class I, chromatography purified. 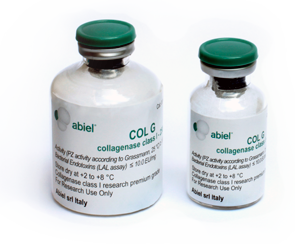 COL G is well suited for tissue dissociation procedures from isolation of pancreatic islets, to primary cell extraction from liver, pancreas, heart, cartilage, dermis, to stem cells extraction from adipose tissue and others. COL G in combination with COL H (collagenases class II) can enhance your cell extraction yield and viability in vitro and ex vivo. Recombinant collagenase class II, chromatography purified. COL H is well suited for tissue dissociation procedures, from isolation of pancreatic islets, to primary cell extraction from liver, pancreas, heart, cartilage, dermis, to stem cells extraction from adipose tissue and others. COL H used in combination with COL G (collagenase class I) can enhance your cell extraction yield and viability in vitro and ex vivo.